One of my mom’s co-agents gave us a trio of Lindt’s Bantons Kirsch. Now I know Lindt’s a pretty common household chocolate you can find at Longs and Safeway, but this baby is sold exclusively in Switzerland (or so I’m told). 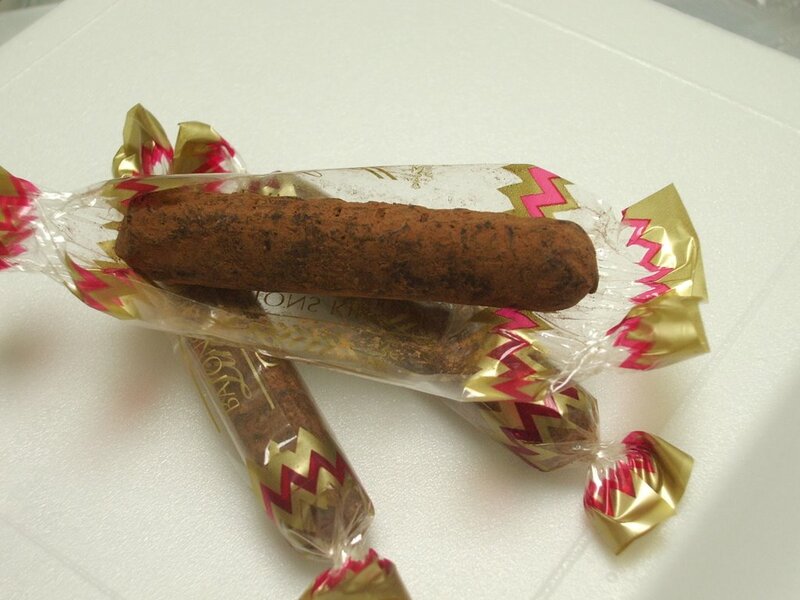 The thin narrow tube of bitter chocolate is dusted in cocoa and filled with Kirsch. Separating the liquor from the chocolate is a brittle sugar shell, slightly caramelized. I don’t drink and my mom’s on an eternal diet so I bit off the top, mom drank the Kirsch and I finished off the chocolate. A perfect compromise, no? 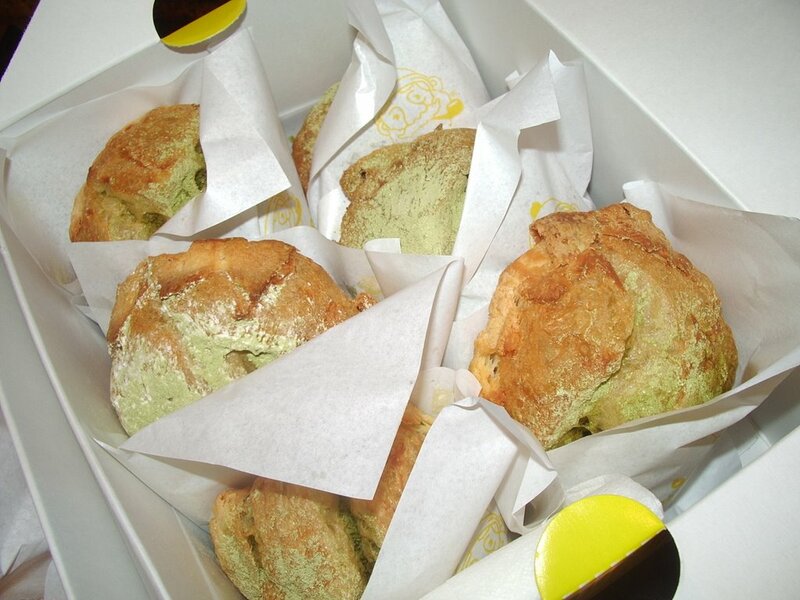 A family of four and a dozen Beard Papa cream puffs? Oh dear, we are sweet pigs. So much for mom’s diet. I find Hawaii’s craze over Beard Papa a bit obsessive. I think it has to do with the fact that our generation has been raised on one type of cream puff alone: THE LILHA COCO PUFFS. Present at every potluck, bbq and grad party, it wouldn’t be a stretch to call them the foundation of Hawaii’s sweet tooth. But since Beard Papa rapidly opened all over Honolulu I’ve noticed that our dear coco puffs have been replaced at parties with these lighter, crispier puffs. In addition to the original vanilla, a “special” flavor is offered each day, today was “Matcha Day.” My dad’s sold on Beard Papa because of it’s “famous” double-shell, an inner shell of choux pastry is surrounded by an outer piecrust-like layer. In contrast, coco puff shells are pretty much soft throughout. And instead of Liliha’s chocolate pudding filling and a generous dab of chantilly, you get a lightly whipped custard with a dusting of powdered sugar. 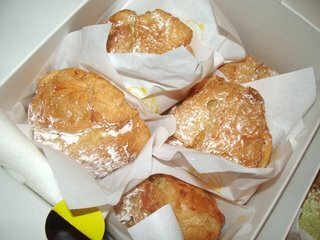 Surely Beard Papa is far more refined than Liliha could every hope to be. But even after rising prices and shrinking coco puffs I still cling onto the nostalgia of running into the bakery while mom waits in the car (cause there’s never any parking space!) to pick up a dozen coco puffs for dinner at grandmas. 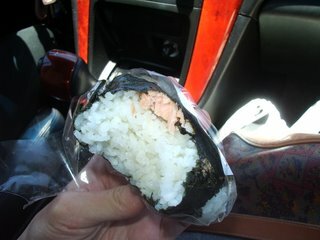 And for the car ride, a little salmon onigiri to nibble on. 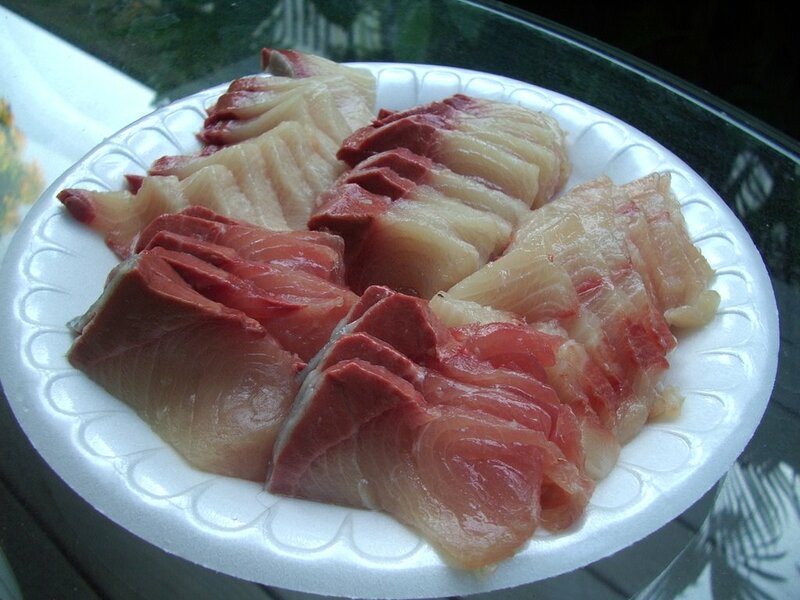 I like to purchase mine from the Marukai in Dillingham. Maybe it’s only me, but the rice there is just perfect. A little sweet with the tang of rice vinegar, even Shirokiya hasn’t been able to duplicate this balance of flavor consistently. Like many Japanese “little meals” or snacks, the onigiri is such a basic treat that quality of ingredients and the simple know-how gained through experience is key in creating a quality dish. My favorite part about coming home for summer? 1. Everyone is so much nicer and happier in Hawaii. 2. Frequent visits to Saint Germain for ham rolls and strawberry shortcake. is this 10, 405 and all those crazy numbers?! 5. Family, friends and supermarket ice cream sandwiches. Ok. Now back to Hawaiiand and Chemistry homework. Lab quiz and oral presentation tomorrow. Yipee. No, really, yipee…lol Oh and dad’s come back from China tomorrow! He gets the funniest American fast food cravings after every trip to Asia – you’d think the Big Mac was the greatest culinary invention ever. No worries though, it dies down after an extra value meal or two. My mom and I cannot help but turn into the Palama Market near Waikiki whenever we’re in the neighborhood. 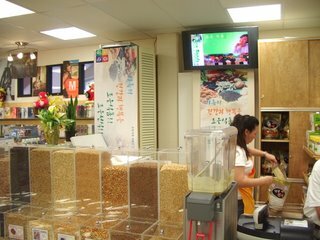 It’s a well stocked Korean supermarket with an adjacent food court. This inappropriately titled “food court” has only one restaurant and a drink/dessert shop. But it’s one good restaurant, so we’ll forgive the deceiving title. The order also came with two mighty scoops of rice, a container of kimchee and “today’s” veggies which included marinated tofu, bean sprouts and watercress. This is a lot of food for only $6! Of all the Korean plate lunch kine places, I feel that the Palama Food Court (yes, that’s the name of the restaurant!) serves the most authentic food. 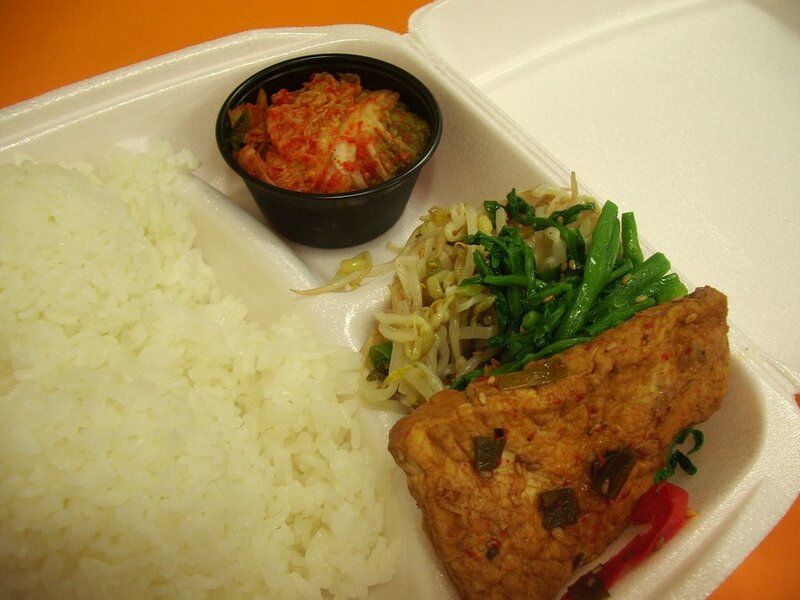 No other quick/takeout places also carry such a wide variety of kim bap (korean sushi) and cold noodles. The side of the market is lined with individual storekeepers selling everything from housewares to mysterious Asian medicines. I usually breeze pass them, but today one guy caught my attention by handing over a free sample. I LOVE free samples. It’s was a tiny cup filled with a thick muddy green colored liquid. I eagerly took a sip, as I’ve come to learn though experience, the stranger a drink looks the better it’s bound to taste. Hence my love for durian, mung bean and avocado milkshakes. The drink instantly reminded me of kinako, a nutty soy flour often used in mochi recipes. It had a slightly honey undertone but I wouldn’t call it a sweet drink. More like a very thick kinanko-ey soy milk. The eager Korean storekeeper was pleased with my instant smile of satisfaction as I happily gulped it down. 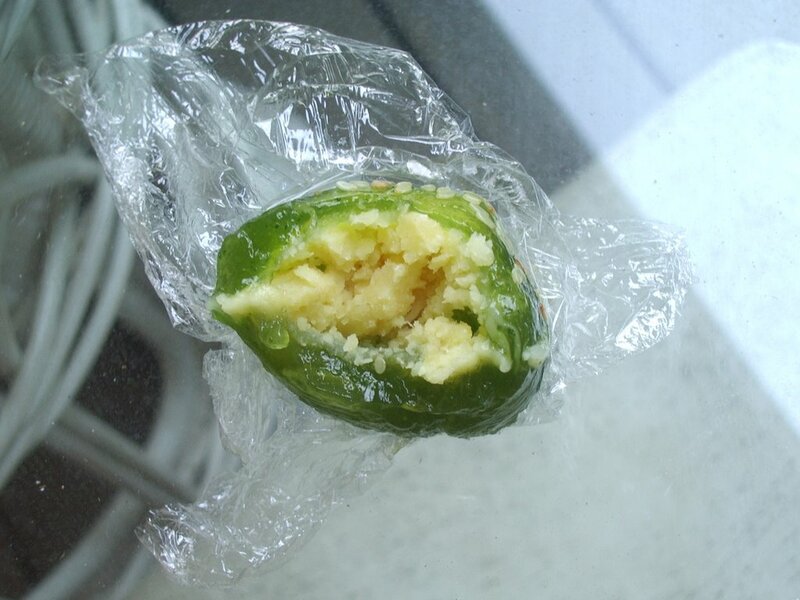 He burst into well practiced speech of the ingredients, “Barley, corn, african millet, kale, banana, pinenut lotus flower seeds, chestnut, spinach, carrot, cabbage, jobs tears, yam…” It seemed to go on forever – what didn’t this concoction contain? 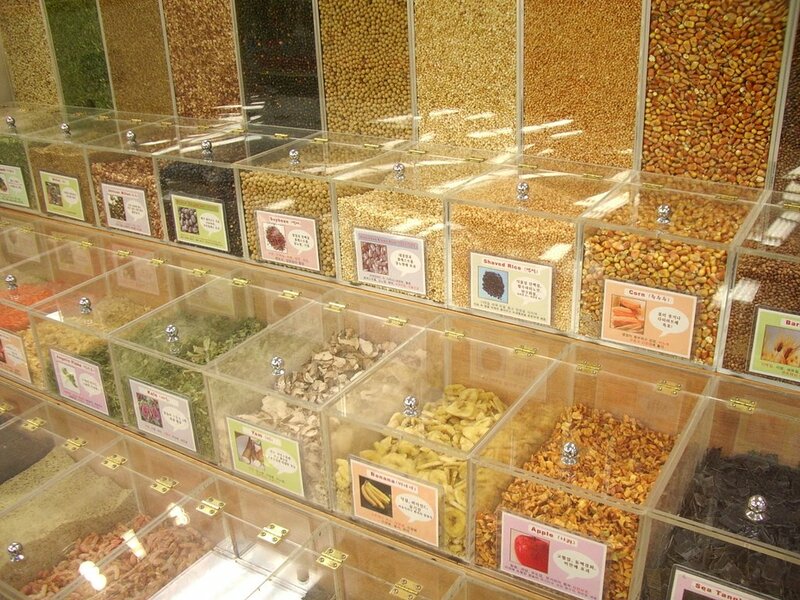 They take an equal mixture of everything in the containers above and grind it into a fine powder. I bought a one pound bag of the Joeun Sunseek. 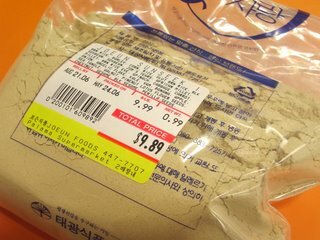 Apparently it’s a newly imported food product from Korea and this storekeeper is Hawaii’s sole distributor. It’s quite easy to make at home. Just mix 2 tbsp with 200 ml of water and add a spoonful of honey to sweeten it just a tad. 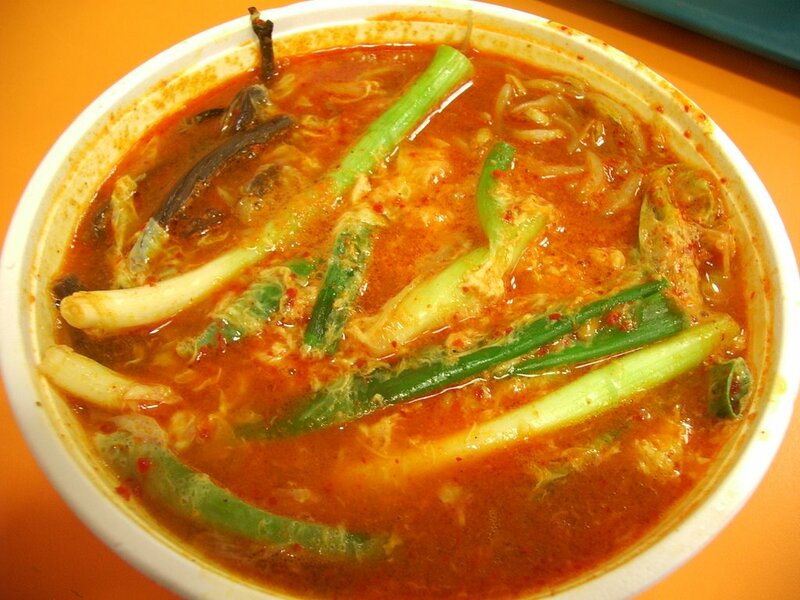 Served hot or cold, it may look a little funky, though drink it anyways cause it’s reeeeally healthy. But more importantly, it’s so damn delicious! Guess what? I’m starting a one month internship at Chef Mavro in exactly a week! AHHHH!!! That’s how I express excitement. I’ll be working a full 40 hours/week with pastry chef Hiromi Okura in addition to 9 hours of school on M/W and 4 hours on T/R/F. I don’t know how I’ll find the time to do everything, and do a good job of it, but when there’s a will (or food, in this case), there’s a way. For sure! And if internship wasn’t enough to keep me eternally smiling, Gail has asked to write for Hawaii Diner. I’ve been asked! To write! I’ve written restaurant reviews for the Ka Punahou in high school and NYU’s Washington Square News, but this…it’s a completely different level for me :) Gah, just so excited. About EVERYTHING. Ok, I’ll stop jabbering and take a breath. Thanks for putting up with my excitement. There’s far too much food energy running inside of me and I’ll burst if I don’t release it somewhere. Hence this blog! 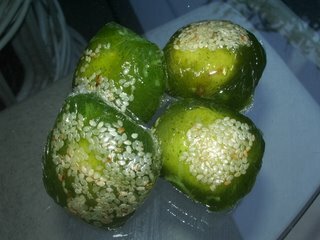 If you’re still reading, I reward you with a picture of my mom’s favorite Thai dessert. Like all Vietnamese and Thai desserts, I am completely clueless as to the proper English name. Name aside, isn’t it beautiful? Each translucent green square is about the sice of a half dollar. The pandan flavored jelly, at once chewy with a bit of a crispy snap, is filled with sweetened mung beans and dotted with a sprinkle of sesame seeds. It’s a lovely dessert/snack for people like my mom (and many immigrant Asians) who find “normal” desserts too sweet and prefer more starchy, lightly flavored treats. The play of textures is very addictive. This jelly is like a cross between agar-agar and a soft mochi. You only get a hint of pandan, letting the slightly nutty flavor of the beans shine though. I think my parents are starting to understand just how badly I want to go to pastry school. They’re quite happy I’m planning to graduate a year early (hence summer school). I just have to convince them to use the saved tuition to pay for classes at the French Culinary Institute. They more or less have it figured that they can’t pull my away from the culinary world no matter how hard they try. They’ve been very supportive of everything I’ve pursued in the past and the more I show an interest/obsession with food, they more they’re starting to come to terms with the fact that I just can’t sit behind a desk as a accountant for the rest of my life (as much as I love the set the balance sheet equal). I cooked dinner tonight! :) We usually eat Vietnamese or Chinese food for everyday dinners, as that’s the type of cooking my parents are have been raised on. However, my dad’s seems to be bored with everyday food…it’s a sad and lonely world when you get bored with what you’re eating! He loves carbs like bread and potatoes so I decided to surprise my parents with a dinner of focaccia and gnocchi. 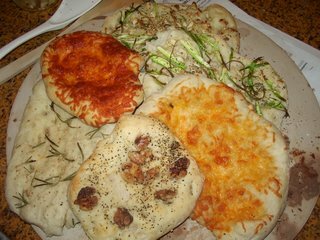 I split a basic focaccia dough into six rounds, making various toppings. For my sister, a couple with only cheese, and lots of it! My mom liked the garlic walnut with pepper and the plain rosemary and sea salt with a good dose of the olive oil I chugged home from Mama’s in Queens. (Airport security thought I was quite a kook for carrying home this massive bottle of oil – one guy said to me, “just make sure it doesn’t break on the plane!”) Will do. The last, though certainly the favorite of the bunch was topped with tooooons of raw garlic, pepper and zucchini. The fun part of focaccia making is that you can finish the dough with practically anything you have lying around the house. I got the rosemary from the neighbors, used of the last few stems of zucchini in the fridge and what Chinese home doesn’t have a constant (and large) supply of garlic lying around? I’m cheap. Or I improvise. It’s all in your perspective. I love eating gnocchi, like really really love! But here’s the catch, I’ve never had exceptional gnocchi that left me floating home with my head in the clouds (I am very much anticipating this day). I’ve had pretty lousy gnocchi from C&C Pasta and semi decent ones from the school dining hall (lo and behold!). I know I’ll love it when I have it. Doesn’t make sense? Soft dumpling like foods appeal to me, as well as simple foods given great care – put two and two together and you essentially get gnocchi. I’ll travel far for a great dish, so please leave restaurant recs, gnocchi of any type or form, just as long as it’s delicious! Getting back to dinner. Fed up with unsatisfying gnocchi and many hours drooling over Bea’s post on Sauteed Gnocchi with Tarragon Tomato Sauce, I said “to hell with lousy gnocchi. I’ll make my own!” Well that was my intention, but before you click on the link please note that my culinary skills are far beneath Bea’s and that my reduplication of her recipe is a younger, not as fabulous cousin, at best. As my dad pointed out, “how come yours look nothing like hers?” I don’t know dad. I didn’t intend for them to look a million times less pretty. It just turned out that way. Or you can be more positive and think of my version as a more user-friendly home interpretation. Eh, my parents complain but I honestly think they enjoyed it. The recipe is standard, with the addition of chives into the dough. Instead of shaping them into the traditional shape pressed with fork tines, the dough was rolled into logs, wrapped in plastic and boiled. After ten minutes, I removed them from the water, peeled of the plastic and sliced into 1/2” thick logs. A brief sauté in olive oil and the end result is quite an unusual take on gnocchi. 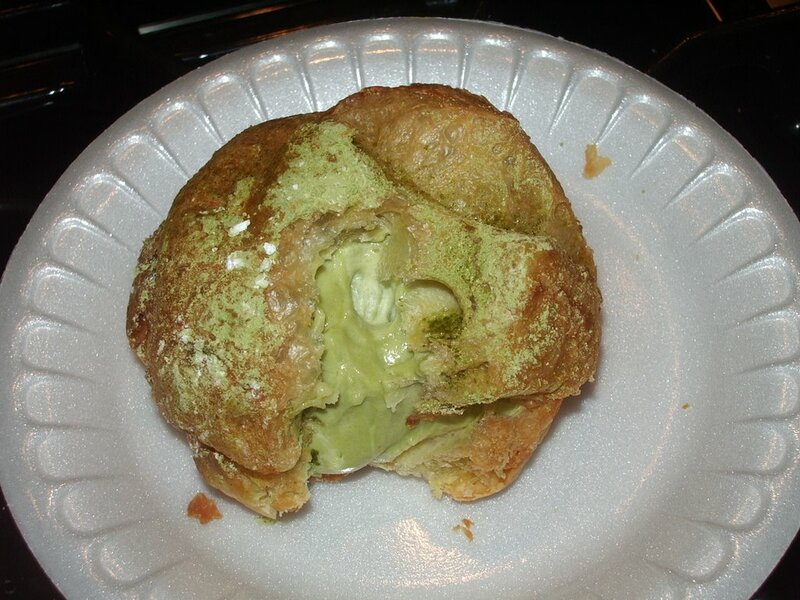 You get a slightly crisp exterior breaking into a mouthful of light pillowy goodness. 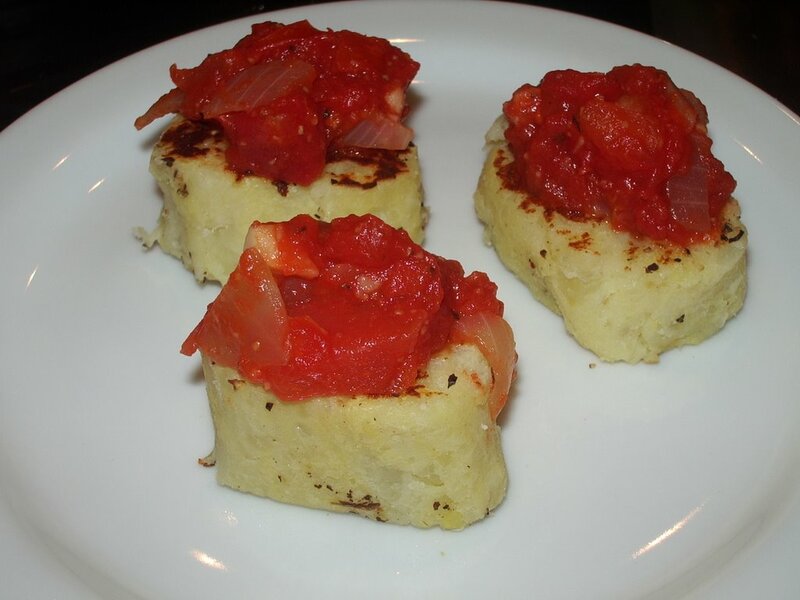 I served them pupu style, each topped with a little mound of fresh tomato sauce rich with onions and garlic. They are addictive, as it’s quite easy to pop one your mouth and savor the simplicity of the sweet tomatoes with potatoes in a duo of textures. I was so tired after cooking that I could barely eat anything. I find that with cooking, I receive more pleasure out of the actual creating process than from eating the food. The most satisfying part is watching the plates being polished off by the one you’ve served, hearing mom and dad go, “that was excellent!” or in the case of Chinese parents, “Not bad. Could be better. But not bad.” It’s in making others and their tummies happy that makes me happy. Everyone benefits in the game of food. And it’s all delicious, just like it should be.